The scenario is all too familiar in sales, an expectation of doing business. People get sidetracked. So what can you do to stay in their minds? You follow up. Research has consistently documented that lead nurturing and follow-up is a tested and true way to get back in a customer’s head. According to DemandGen Report, nurtured leads produce an average 20% increase in sales opportunities versus non-nurtured leads. Forrester Research found that companies which nurture leads make 50% more sales at a cost that’s 33% less than non-nurtured leads. In a study by CSO Insights, companies that excel at lead nurturing reported having 9% more sales reps making quota. The magic of an effective follow-up, however, doesn’t always happen with a check-in about whether the person is ready to buy. Typically, the successful follow-up is more a golden chance to dig deeper and rekindle the spark that happened back on your customer’s first visit. Maggie Freeman, who’s worked at Bullfrog Spas of OKC as well as two other spa stores, outlines two key components to the lead follow-up process: getting the lead, then inputting the information into a follow-up system that provides not just ease but consistency for all store salespeople. Of course, you don’t need to be convinced that each person who walks into your store should be considered a prospective buyer and potential lead. They walked into a hot tub store…They want a hot tub. This simple realization makes securing and recording contact information of any and all traffic a priority to enable the follow-up. And getting more than one piece of contact info can be helpful. Follow-up is a chance to educate and update. The more you help your customer understand the product, the more you move the sale forward. In addition to contact info, it’s your job to find out what her spa hopes and dreams are. And every customer wants something a little different out of her experience with you. In his book Socratic Selling, sales specialist Kevin Daley points out that today’s customers want to be heard rather than sold to. Ask questions to start a conversation and find out where this specific customer stands. Is your customer shopping around for ways to spruce up her back patio? Or is she thinking “hot tub” to get some all-over relief on her arthritic joints? When you know a customer’s spa concerns as well as she does, you can tailor your follow-up to personally address her situation and provide information that will appeal to her needs. Some customers won’t be quick to hand over their heavily guarded information, and that’s ok. Do your best to sweeten the deal by mentioning that you want to remind them about coupons and sale events which could lead to a lot of value for them. At the end of the day, even the more standoff-ish customers will appreciate your no-pressure attentiveness as they start to think seriously about making a purchase. You’ve got the customer’s information, now what do you do with it? 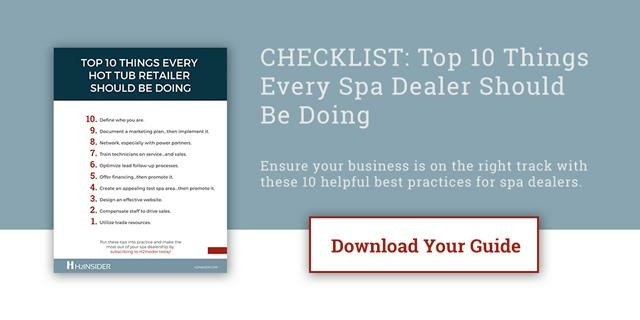 Freeman says, “In my experience, spa store leads tend to fall by the wayside unless there’s a designated place to keep the information.” Whether it’s as low-tech as an index card box, a simple electronic file like a spreadsheet, or a more robust CRM system, a single database that everyone can easily access is essential for consistency. She points out that all staff members need to understand how the database works along with its purpose, so every sales person on your team becomes 100% invested in the same follow-up process. Business coach Dan S. Kennedy recommends creating a company-wide database that can be divided into meaningful categories, like people who are actively shopping for their first spa and those who may be thinking of a replacement. This will be the best way to determine where to start your next conversation with each lead. The database also comes in handy for cross-merchandising—the customer who comes in every month for upkeep supplies might be interested later on to learn about new, lower-maintenance spas. Recognized as one of the top five most influential people in sales lead management, Lisa Cramer of LeadLife Solutions states, “The most important facet of successful nurturing is that marketers can identify what’s working and what’s not.” So it’s important that the database you implement provides results you can measure, like prospect interaction and promotion of leads to sales. Tracking and reporting this customer data is where CRM systems like Hubspot, Infusionsoft, Salesforce, or many others excel. Think of the follow-up as an opportunity to find out what you can do for the customer instead of asking if the customer is ready to do something for you. Leadlife’s Cramer suggests that the the follow-up connection relies more on helpful information rather than a sales pitch. Think of the follow-up as an opportunity to find out what you can do for the customer instead of asking if the customer is ready to do something for you. In other words, use the follow-up to focus on what the customer wants and what you can do to deliver it. If she’s on a budget, send her a personalized postcard and a coupon. If she’s shopping around, chat over the phone about special packages that will give her discounts on her future upkeep supplies. If she’s still deciding whether or not she’s a hot tub person, e-mail her some links to web articles about spa therapy, along with a link to your website. Creativity is key, and every customer is different. Rome wasn’t built in a day, and closing a high-value sale like a hot tub in one visit is a steep challenge, even for a veteran salesperson. A study conducted by the Association of Sales Executives found that 81% of all sales happen on or after the fifth contact—that’s a lot of follow-up, but it pays off. Get to know your customers, and use the follow-up as a way to stay in their minds as they mull over this major purchase. A study conducted by the Association of Sales Executives found that 81 percent of all sales happen on or after the fifth contact. Divide your contact database into short follow-ups and long follow-ups. If a customer has spent a lot of time chatting with you about specifics, make a note to reach out to her in a week or two with a coupon, and reach out again as time goes on. If a customer just isn’t going to drop big money on a spa anytime soon, hand her some company swag—a soda koozie or a floating keychain—and ask if you can get in touch with her during the following season’s sale event when this year’s models will be at their lowest prices ever. Of course, when it comes to follow-up, don’t forget about the customers who’ve already made their purchase. Send a personalized thank-you note, and follow up about ongoing questions or concerns they have. When you follow up regularly and with purpose, your customers will continue to value the relationship. Since keeping up with current customers yields more sales potential than chasing after new leads, make those relationships count by hitting the right tone in the follow-up. Handing over a snazzy business card with your name on it isn’t going to build a high-value relationship all by itself. Court your customer throughout the sale, using his or her first name and taking the time to really listen to expectations, questions, and concerns. A study from Youngme Moon of Harvard Business School shows that customizing a marketing message style based on customers’ unique personalities can yield fruit at the end of the day. In general, communication should engage prospects with a conversational tone and relevant personal content that encourages action on their part rather than outright branding on yours. Additional rapport-building tips, like simple mirroring techniques, are offered at SellingPower.com. When you make your customer feel like one in a million, you set a tone for trust and loyalty. Since the spa experience is all about relaxation, replicating that feeling with no-pressure attentiveness and an earnest drive to help the customer goes a long way. Remember, you’re dealing with people, so the personal touch and an attentive attitude will take your relationships to places a nonspecific follow-up just can’t. Erin Seaward-Hiatt is a freelance writer and editor. She is currently working on a master’s degree in English and lives in Utah. You can read more about her work at www.erinhiattwrites.com.